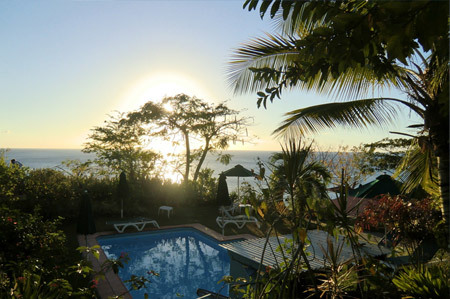 at the Tamarind Tree Hotel & Restaurant in Dominica, West Indies! * Closed during the month of September. 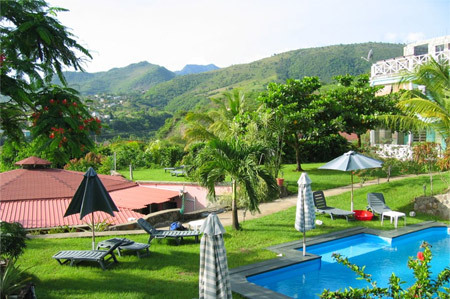 The Tamarind Tree Hotel is located in the middle of Dominica's west coast on top of a 100 foot cliff, offering a beautiful view over the Caribbean Sea, the Bay of Salisbury and Morne Diablotin. 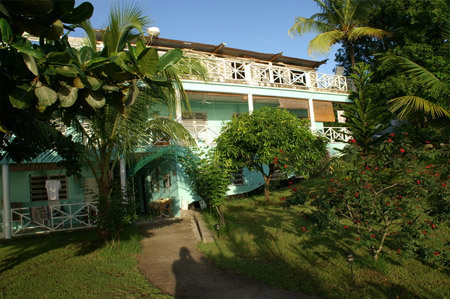 The Tamarind Tree Hotel is a pleasing middle class hotel, situated in between the beaches of Macoucherie and Salisbury. The beach of Macoucherie is jus a 3 minute walk away and the beach of Salisbury, where the dive center East Carib Dive is located is a seven minute walking distance. Facilities include restaurant, bar and swimming pool. Activities available include diving, hiking, sight-seeing excursions, whale-watching, game fishing and sailing. The Tamarind Restaurant offers tasty snacks throughout the day and in the evening, fine creole and international cuisine. Fall in love with the enchanting sunsets while sipping an exotic cocktail, enjoy an excellent dinner in a pleasant atmosphere or have a good time at the bar by tasting the homemade fruit rums! What do you call an island that is 26 million years old? A baby and thus, Dominica's beauty. The youngest island in the Caribbean, erosion has yet to dull the sharpness of her terrain. Beautiful dramatic angles are everywhere. Energetic rivers run vigorously. Dynamic forests remain untouched. When you first ride through the countryside, the uncompromising beauty of the island - rolling hills, secluded coastlines, virgin woods - will make you feel as if you're at the end of the world. 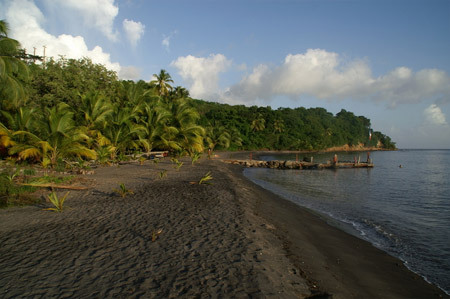 Dominica is without doubt, "The Nature Island of the Caribbean". So come and explore ir simply bask in nature's simple pleasures. Tax and service charges of $29.00 per room per night are additional.